X The muscles in its wings and legs are strong. It can easily fly while gripping a small Pokémon. X Die Muskeln in seinen Flügeln und Beinen sind stark. Es kann im Flug sogar ein anderes Pokémon tragen. X Ses ailes et ses pattes ont des muscles développés. Il peut voler en agrippant un petit Pokémon. X Sus alas y sus patas son muy fuertes. Puede llevarse volando Pokémon pequeños. X I muscoli di ali e zampe sono molto sviluppati. Vola senza fatica anche portando un piccolo Pokémon. X 날개와 발의 근육이 강해 작은 포켓몬을 붙잡은 채로 너끈히 날 수 있다. Y When Staravia evolve into Staraptor, they leave the flock to live alone. They have sturdy wings. Y Wird Staravia zu Staraptor, verlässt es die Gruppe und lebt allein. Seine Spannweite ist gigantisch. Y Lorsque Étourvol évolue en Étouraptor, il quitte son groupe pour vivre seul. Ses ailes sont très développées. Y Al evolucionar a Staraptor deja su bandada y pasa a vivir en soledad. Sus alas son inmensas. Y Per diventare Staraptor, lascia il gruppo e affronta la vita da solo. Possiede ali robustissime. Y 찌르호크가 되면 무리에서 떨어져 혼자서 살아간다. 강인한 날개를 가지고 있다. 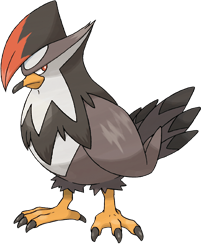 Omega Ruby When Staravia evolve into Staraptor, they leave the flock to live alone. They have sturdy wings. 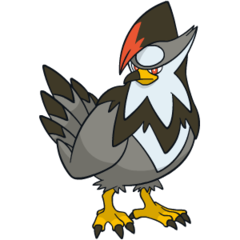 Omega Ruby Wird Staravia zu Staraptor, verlässt es die Gruppe und lebt allein. Seine Spannweite ist gigantisch. Omega Ruby Lorsque Étourvol évolue en Étouraptor, il quitte son groupe pour vivre seul. Ses ailes sont très développées. Omega Ruby Al evolucionar a Staraptor deja su bandada y pasa a vivir en soledad. Sus alas son inmensas. Omega Ruby Per diventare Staraptor, lascia il gruppo e affronta la vita da solo. Possiede ali robustissime. Omega Ruby 찌르호크가 되면 무리에서 떨어져 혼자서 살아간다. 강인한 날개를 가지고 있다. Alpha Sapphire The muscles in its wings and legs are strong. It can easily fly while gripping a small Pokémon. Alpha Sapphire Die Muskeln in seinen Flügeln und Beinen sind stark. Es kann im Flug sogar ein anderes Pokémon tragen. Alpha Sapphire Ses ailes et ses pattes ont des muscles développés. Il peut voler en agrippant un petit Pokémon. Alpha Sapphire Sus alas y sus patas son muy fuertes. Puede llevarse volando Pokémon pequeños. Alpha Sapphire I muscoli di ali e zampe sono molto sviluppati. Vola senza fatica anche portando un piccolo Pokémon. Alpha Sapphire 날개와 발의 근육이 강해 작은 포켓몬을 붙잡은 채로 너끈히 날 수 있다. Diamond A Pokémon with a fierce nature. It will boldly challenge foes even if they are bigger than it is. Pearl The muscles on its wings and feet are so powerful that it can still fly comfortable even when it is gripping small Pokémon in its claws. Platinum It never stops attacking even if it is injured. It fusses over the shape of its comb. SoulSilver When STARAVIA evolve into STARAPTOR, they leave the flock to live alone. They have sturdy wings. Black It never stops attacking even if it is injured. It fusses over the shape of its comb. White It never stops attacking even if it is injured. It fusses over the shape of its comb. White 2 It never stops attacking even if it is injured. It fusses over the shape of its comb.